List of widgets submitted by azia. Widgets submitted by azia will be displayed in the order submitted. 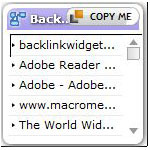 This widget displays the backlinks to your blog or website. A great, free SEO tool.